Bill Callahan has been around the block for many a year now, from ploughing his trade under Smog to being plain old Bill. This is his 14th album, recorded live with his band and blends his dry baritone with a barrel of black-hearted introspective lyrics. Call Bill a miserablist and you've probably heard one song without even paying proper attention to the strength of his delivery and his sparse and calmly spoken words. Under Smog he triumphed with Knock Knock. Rich and effervescent in its sound, it remains his greatest album. The sublime Dongs of Sevolution followed and it seemed he was destined for some mainstream success. However, that never materialised but it shouldn't detract from his fantastic and opulent back catalogue. What Callahan does well on record is his clever use of space. Not content to fill up the gaps between vocals he lets the listener breathe in his perpetual ramblings and his portentous honesty. 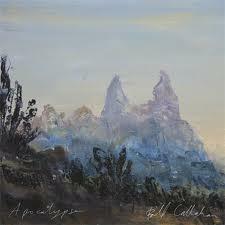 On Apocalypse, he is buoyant with what is effectively a live album due to the exclusive and unusual way he has recorded the seven tracks on show here. Opener 'Drover' is rich in thickly plucked strings, looping violin and minimalist drums and sets the scene lyrically for the rest of the album with its focus on the American West. 'Drover' is the cowboy who is master of the land and his flock of animals which he adroitly consumes. The sombre and macabre 'Baby's Breath' gives you chills as it seems to tell the tale of a lost one: "She was not a weed she was a flower". Make of that what you will, as Callahan doesn't do the obvious lyrically. 'America' seems to have a dig at his home country and the way it belligerently treads over everyone else. The whole thing is resplendent in a fuzzy guitar wig-out and Callahan doesn't hold back. Next up is the flute-led 'Universal' with its sparklingly gentle bass: "Bees only swarm when they're looking for the home, so I followed them, I found the bee's nest in the buffalo's chest". Metaphor/ambiguity/subtlety/nonsense - Callahan has them all. 'Riding for Feeling' is a stripped-down bare torch song, painting a picture of loneliness: "Leaving is easy when you've got some place you need to be, I'm giving up this gig for another season". 'Free' is simply beautiful with its gently brushed drums and two note piano refrain. He closes with the eight minute epic 'One fine morning' and it's a cinematic tribute to waking up and taking in the beauty of all things in the countryside of the USA. This is a simply beautiful album. It's a breathtaking listen and Callahan's vocals are beyond description. One of the best of 2011 and if I hear better I will eat a cowboy hat! Bill Callahan is pro USA and is celebrating things American and suggesting everyone should stop hammering them, so I guess the opposite to what you understood. Fair enough Tedroy. Just my interpretation of the song after a couple of listens to it.